The import button no longer works for me when trying to import a creature. It seems I can import everything except for creatures... am I the first to encounter this issue?? Two separate installations on two PCs are having the same issue. .19 is a Beta, it's possible the importer is not ready, but the beta release needed testing for everything else. I'll ask about it. Also, please fill in these details, so we can help you better. Thanks for the response, but I actually solved this by doing a fresh install instead of installing over top of an old one. So probably just something that needs to be addressed with the installer. If you still need those details, I can provide them a little later tonight. I already knew about the HL importer setting stats to 10 (which I hope gets fixed soon); this is something different. My group is moving from 3.4.5 to 3.7.1.19. I exported every creature in my old library, then imported them into 3.7.1.19. I opened up the creatures in the library and everything looked good. Cool! Then I dragged a creature onto the a map, and opened up the token. Everything looked good except....Dexterity was now set to 10 instead of 18. Huh, weird. I manually set the value to 18, then closed the token editor. When I reopened the token, all the other stats EXCEPT Dexterity were now set to 10, and dexterity was at its correct value of 18! 1. Examine creature in library; all ability scores are correct. 2. Drop a creature onto a map. 3. Examine the token; Dexterity is now 10. 4. Set the statistic to a different value, close the editor. 5. Reopen the same token; all statistics except dexterity are now 10. Dexterity is set to the previously saved value. Why are the stats correct in the library but wrong on the token when dropped onto a map? Any help is greatly appreciated! There are enumerable reasons that could cause this, the least of which is the massive gap between the two datasets (3.4-3.7) you are are trying to use together. It would be like trying to take parts off of a 1980s Pontiac and wonder why they didn't fit and work exactly as expected on a 2017 hybrid. I'm not trying to be funny at your expense, just point out the technical hurdles involved in a layman's terms. Please export one of the tokens/creatures from your map and post it here, I'll take a look at the file this morning over coffee. Ok, I've attached an export from 3.4.5 that is displaying the behavior when imported into 3.7.1.19 that I detailed in my post above. Stats match what is in the library when placed on the map. I'll try it under Pathfinder, in a few minutes. Ugh. Very frustrating. I've installed the 3.7.1 RC alongside 3.4.5 and 3.7.1.19. I've imported that Zemfer token into both PF and DnD 3.5 ruleset campaigns. Same effect every time. Very strange, can you post your log please? 3.7.1 and 3.7.1.19 beta .log files attached. I tried it with Pathfinder in both the release and beta 64 bit versions. 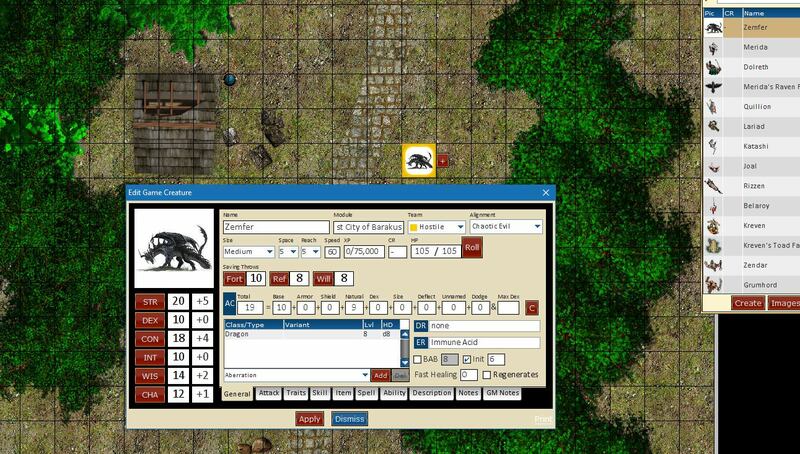 In the release, the stats stay the same when I put the creature on the map. In the beta, they reset to 10 when I put it on the map. In both versions, the stats are correct in the content library, when I click on the creature's image. Thanks Mickey. Notice that the RC didn't handle it correctly either: Zemfer's DEX is 14, not 10. Also, if you change the dex to a different value, click apply, then open the same token on map a second time, I'm guessing you'll find all the values are now 10, just like in the beta. 4. Edit the token, all stats are correct! 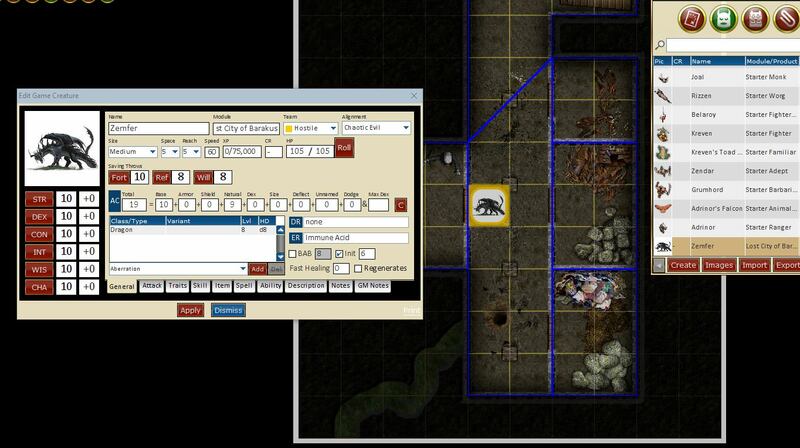 I don't know why, but after importing from the earlier version of d20Pro, it's necessary to open the creature in the library and then hit 'Apply'. Well waddyaknow? I never noticed that DEX was supposed to be 14 because, obviously, all the other stats looked fine. Probably raises more questions lol. Bizarre how ONE stat gets reset but the others are ok.
Nice one! I never thought to do that. At least there's a temporary fix until a proper solution can be figured out. Good to know, I'll ask @owlbear about this might be. Import "works" but it's completly wrong (including changing class from monk to fighter and many other random changes). That's...very problematic. If there is easy fix please share I need it for weekend.